Cho (right) competes in the heavyweight division. To the mainstream American sports audience, mixed martial arts (MMA) has emerged as the combat sport of choice. At any given time of day, you can scroll through the cable TV lineup and there’s a decent chance you’ll find Ultimate Fighting Championship (UFC), Bellator, World Series of Fighting or King of the Cage to watch. And yet for all of the complexities and blended disciplines of MMA, there is still something appealing about the simplicity of Taekwondo. The name of this relatively new Korean martial art — Taekwondo was established in the 1950s as a unification of ancient styles being used in the country at the time — translates loosely to “The Way of the Foot and the Hand.” But if you’ve ever watched Taekwondo, it’s almost exclusively the feet that are used to strike. To oversimplify, it’s like boxing with your feet. There is a sweetness to the tactical science of it all, but at the same time, a Taekwondo bout can end in a flash with one knockout blow. 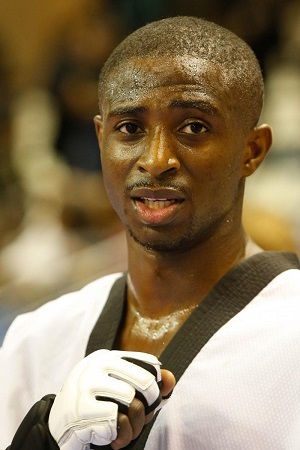 Mahama Cho is one of the best Taekwondo fighters in the world. Standing 6-foot-3, the 25-year-old represents Great Britain in the heavyweight division (80 kilograms or 176 pounds and up). Currently ranked No. 4 in the world in his weight class, Cho has won gold medals at the Dutch Open, German Open, Israel Open and U.S. Open. He won the heavyweight title at the 2013 World Taekwondo Grand Prix, but on his way to defending his crown last month, Cho was eliminated by reigning Olympic champion Carlo Molfetta of Italy. 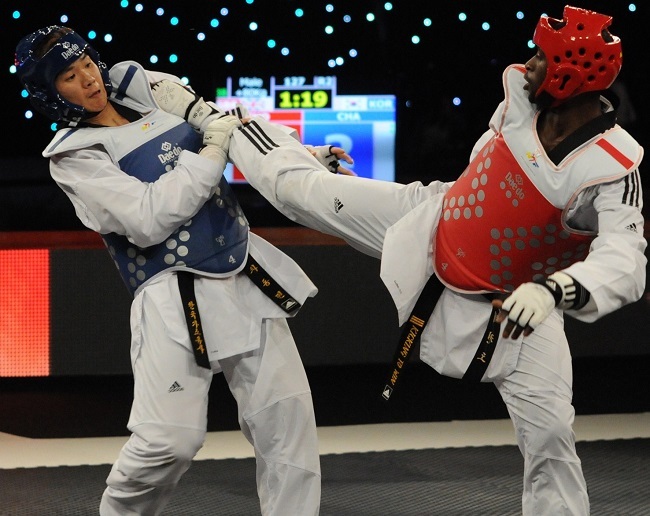 Cho was born in Ivory Coast and raised Muslim by his grandmother before he moved to England at eight years old to live with his father, Zakaia Cho, a former African champion in Taekwondo. The younger Cho excelled in soccer early on, playing semi-pro as a teenager and earning a few major-league tryouts. Eventually he decided to focus on Taekwondo and became a rising star in Great Britain’s national team program. But when he failed to make the Olympic team in 2012, Cho set the sport aside to move to Paris and attend college. While there, he was recruited by France’s national Taekwondo team and began competing for them, essentially defecting from Great Britain. But when his French citizenship wasn’t approved in time to compete in the 2013 World Championship, Cho again planned to retire from competition before his father convinced him to rejoin Team Great Britain. Fully committed to his sport and now settled in Manchester, England, Cho has his sights set on the 2016 Olympics in Brazil, where he is already considered his country’s best hope for a gold medal. UMMAH SPORTS: What separates Taekwondo from other martial arts that we might see on TV, like karate or Brazilian ju-jitsu? MAHAMA CHO: Well, Taekwondo is an Olympic sport, like judo. Taekwondo is full of surprises; there can be knockouts at any time. It’s fast, dynamic, explosive and great to watch. I find Taekwondo to be more of an all-around art than the others. What is your daily training routine like when you’re preparing for a competition? My typical daily workout is at least four to six hours a day split into two or three sessions a day, with each session lasting at least two hours. How do you break those sessions down as far as sparring, conditioning, weightlifting and so on? We balance it out across the week. Have you practiced other martial arts or played other sports besides soccer? In secondary school I played all sorts of sports, like every other kid. Basketball, table tennis, cricket and many more. It looks like you’ve been able to travel the world with this sport. Alhamdulillah, I have been around the world. I’m grateful to Allah that I can explore these beautiful places with my team. I know that in every country there are athletes in Olympic sports who can’t focus on their sport full-time because they have to work to support themselves. Not everyone is getting rich doing this like Usain Bolt. Are you in a position where you can focus on Taekwondo full-time, or do you have to balance a job as well? I don’t have a salary, however I do get aid from the federation toward my sport, which makes me a full-time athlete. I don’t have to do anything but (Taekwondo). I am a free agent to sponsors and companies. I can invite them to invest in me and I will represent them around the world. So if you know any Islamic companies looking for athletes to promote anything, I would work with them. What do you have to do to qualify for the 2016 Olympics? Right now I am the No. 4 best fighter in the world, and I need to be in the top six at the end of 2015 to qualify for the Olympics. With the grace of God if am still in the same position this time next year, then I will be qualified, inshaa Allah. What major events will you have between now and then? Well, we have the Commonwealth Games coming up in about a week’s time. That will be in Scotland. Next year we have the World Championship, the European Games and the European Olympics. Inshaa Allah we will do our best to get medals from them. I was raised Muslim. I went to madrasah (Arabic school) till I was eight, and then I came to England for my education. My whole family is Muslim. My dad is the president of the Ivorian Islamic Trust in London. What about Islam most appeals to you? Why is it the right religion for you? Islam is what saves me in my everyday life. Praying is what cleanses me from my sins, and Allah is who takes care of me every day. Without Allah in my life, I am nothing. I also love going to the mosque to pray with people. Do you have a favorite surah or verse from the Quran, or just one that has really stood out to you lately? Surat Yassin (36). I love it a lot. As an athlete, do you feel like you’re an ambassador of Islam to maybe those who follow your sport? I promote my religion to the best of my ability through my sport. In my life, showing a good image and then letting people know that I am Muslim is why I think people end up attracted to me. They don’t concentrate on the negativity of Islam but the beauty of what I do as a professional through Islam. Some people don’t know I am Muslim till they meet me and ask me personally, and they’re surprised because the image they see through me is not what they see on TV. And if my image to people makes them change to Islam, than Alhamdulillah. You’ve lived in Ivory Coast and in England. What’s the difference between the Muslims communities in those places, and the difference in how Muslims are treated by non-Muslims? In my community (in England), Islam is not as big as it is in Africa. Because we’re living in a Christian country, when you say, “What is Islam in one word?” you will find a lot of people will refer back to what they see on TV. Have you ever felt a conflict in practicing a religion that teaches peace and being good toward others, but competing in a sport that could be seen as violent and in which you could potentially hurt somebody? Not at all. Islam loves seeing Muslim people winning, and other people love seeing people with good personalities and sincere people winning, so on both sides you can’t lose. The sport of Taekwondo is not violent at all. Every competitor has a lot of respect for each other, but it’s still a sport where everyone wants to win, just like hockey or American football. And you will do what it takes to win. Will you take on a fight or a tournament during Ramadan? Are you able to be as sharp or diligent in your training during that month because you’re fasting? I do take on people (during Ramadan). I find myself (to be) even stronger when I am fasting. Are there lessons you can take from Islam that make you a better fighter? One lesson I take from Islam is how the Prophet Muhammad, peace be upon him, fought to get his message to everyone around the world. That fight is what I base my life on; the hardship and suffering he went through motivates me to keep pushing and never give up.